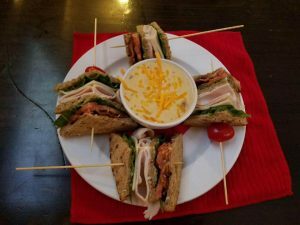 Hungry locals and tourists have discovered a lively destination for lunch or dinner at Broken Anchor Bar and Grill in Old Town Bandon. The restaurant opened in the spring of 2016, delivering a friendly atmosphere with weekend entertainment. The menu is a hip assortment of grill fare served as late as midnight. And, folks are eating it up. 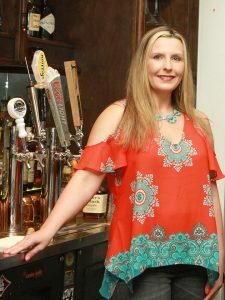 Owner Jessica Neal is originally from Grand Marais, Minnesota. Two years ago, she was scoping out the Portland, Oregon food scene. Her aunt and uncle, (Second Street Gallery owners Peter Bauer and Candace Kreitlow), invited her to check out Bandon. Neal started working in restaurants as a teenager. Since then, she’s worked in more than half a dozen rural and urban restaurants, doing everything from waiting tables and tending bar to dishwashing and food prep. She earned her undergraduate degree in speech communications followed by education credentialing. But, she found herself returning to food service. Neal discovered Bandon’s small town vibe reminded her of her home town: a picturesque waterfront setting that attracts tourists. What pleased her most was the friendly atmosphere she missed while living and working in bigger cities. 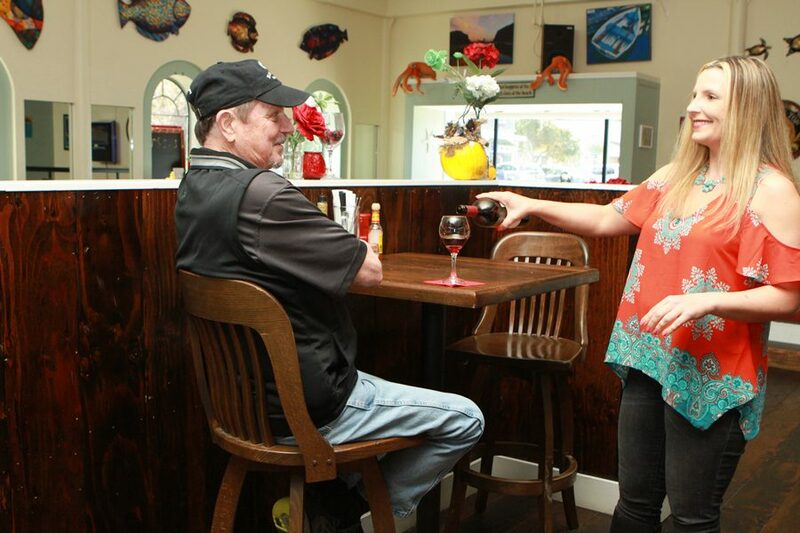 She also decided Bandon still had room for a bar and grill with late-night food and live music. Neal dropped anchor in Old Town, at the corner of Second St. and Chicago Ave. The restaurant is a family-friendly lunch or dinner spot. Colorful fish decorate the walls, with specials and entertainers are listed on an oversized chalkboard. Customers can choose traditional or bar-high tables. Youngsters can test their skill with the giant Jenga game, or play shuffleboard. The stage is just right for soloists or small music groups. Broken Anchor staff hosted a one-year anniversary celebration in May 2017. Guests sampled new menu items by Chef Ian Boyd, and Bandon’s surf rock band Pigasus Trio made a late-night appearance. Specialty house cocktails top the drinks list. “Our Bloody Mary has bacon and blue cheese stuffed olives, and that’s been a big hit,” said Neal. 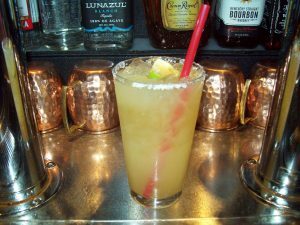 Classics such as margaritas and mules get an Anchor spin customers enjoy. Oregon Coast brews from 7 Devils Brewing, Bandon Rain, and Arch Rock Brewing are on tap. And, Neal suggests sampling Bandon Rain hard cider in the Anchor’s version of a Moscow Mule. The grill-style menu at Broken Anchor is well rounded. Sandwiches, burgers and pizzas are popular choices. A variety of seafood selections fit the coastal setting. Fish tacos are served on corn tortillas with a zesty cucumber pico de gallo. Those with lighter appetites will find several salads and daily soup selections. And, yes, there’s a kid’s menu. Look for local and out-of-town musicians playing weekends at the Broken Anchor. Featured solo acts and small groups present varied styles, from folk to rock ’n roll. “People love the live music,” said Neal. Seating is first-come, first-served, except for large parties. Reservations are recommended for groups of six or more, especially on weekends. Minors are permitted in the restaurant until 10 p.m. Broken Anchor Bar and Grill is at 325 Second St., in Bandon, 541-329-2326, brokenanchorbar.com. Article by Geneva Miller, edited and republished by permission of the Bandon Western World. Photos by Geneva Miller (top, inset 1) and Jessica Neal (inset 2 and 3).